There is a reason Austin is considered the Live Music Capital of the World and the downtown Austin music scene is it. Well, that and Austin City Limits (ACL) and South by Southwest (SXSW) and a few dozen other music events. WINNER OF POLLSTAR'S 2013 BEST NEW MAJOR CONCERT VENUE IN THE WORLD---The venue has held such acts as Journey, the Zac Brown Band, Lynyrd Skynyrd, and KISS. For over 33 years, Austin City Limits has presented live music to audiences across the world. The award-winning series spotlights artists of every musical genre; from rhythm and blues to rock, jazz, and alternative music. Kind of like how Peyton Manning's career has eclipsed that of his father, Archie Manning, the ACL Music Festival has grown to the point that when someone mentions "ACL", they are probably talking about the music festival. Dozens of local acts play ever year and the festival has also featured headliners like Pearl Jam and the Foo Fighters. The Austin Jazz Workshop is a unique project that brings professional jazz musicians directly into the public school classroom to work with young people. This site has information on local bands, clubs, Karaoke venues, local DJs and KJs, and events in Austin. The Central Texas Karaoke Connection. You may have heard of the slogan 'Keep Austin Weird'. This may have been the event that started that. Happening since 1963, this festival honors the birthday of the eternally depressed donkey, Eeyore, from A.A. Milne's Winnie the Pooh series and features tons of live music, food, drink, and drum circles. The raised goes to benefit local non-profit organizations. A popular music venue and the home of the Texas Longhorn Men's and Women's basketball teams. The H-E-B Center at Cedar Park is not only a popular venue for concerts, but the home to not one, but TWO minor league teams: the Texas Stars, the primary affiliate of the NHL’s Dallas Stars, and the Austin Spurs, the NBA Development League affiliate for the San Antonio Spurs. Named the "Best Bluegrass Band" by the Houston Press Music Awards two years in a row. Go to their web site to book them for your next event. The Nutty Brown Cafe and Amphitheatre is the Hill Country headquarters for outstanding Live Music and great times. Excellent music, great food with a breathtaking view overlooking the beautiful Hill Country and Lake Travis. 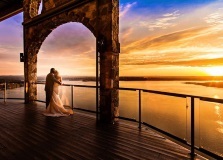 The Oasis is a one-of-a-kind, full service wedding venue. We love to give complimentary tours, as there is nothing more special than helping soon-to-be-married people envision a ceremony. SXSW is an annual March music festival that has grown to include independent films, comedy, gaming, emerging technologies (techie stuff) and a myriad of other cool stuff. the Austin Web Page, please let us know by emailing us.